We recently sold our home in North Reading and purchased a property in Chelmsford, with Catherine Hubbard as our listing and buying broker, and the experience couldn't have been better. Catherine is a consummate communicator and attended to all the details of the sale and the purchase with extreme sensitivity and thoroughness. She was knowledgeable about the process and kept us well informed regarding the important details of both the sale and purchase of our properties. Catherine is an extremely accomplished communicator and was always prompt and thorough in her emails and text messages involving the details of both transactions. We can honestly say that if it were not for Catherine, we would have endured far more stress and would have missed several important details which could have jeopardized either the sale or purchase. It was indeed an honor to have Catherine "in our corner" and we would be happy to speak to anybody in the position of buying or selling a property about our very positive experience with Catherine. After my Dad passed away suddenly in Oct 2015 I needed to find a realtor to sell his home in Andover, MA. Catherine Hubbard was my realtor when I sold my Dads home in early 2016. She worked tirelessly for 6 months reassuring and advising me that we would have a successful outcome. Even though we hit a few unexpected bumps along the way she kept her eye on the goal and always listened to my input before making recommendations. Her professionalism and optimistic attitude was much appreciated and I would recommend Catherine to anyone selling or buying a home. We know we aren't the only clients that you are working with right now, but it feels like we are! 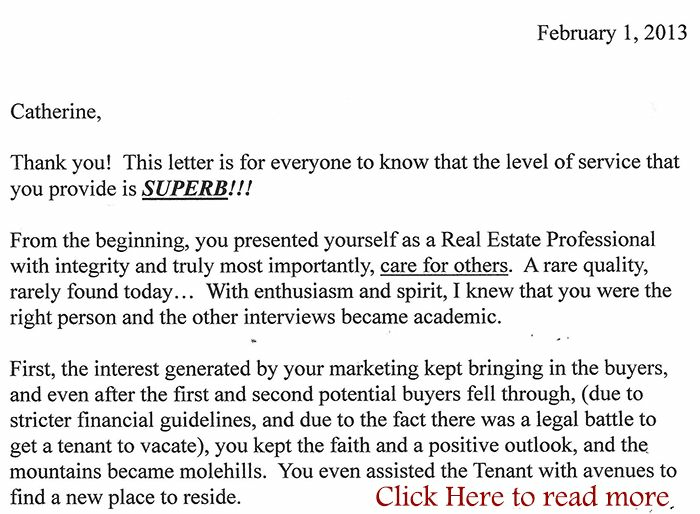 In 2014 we had a horrible experience with a real estate agent, and only 4 months later we met you, and you have been the extreme opposite to the other agent. Whenever we had a question you always found the answers, and you have been so helpful in so many ways words cannot be expressed. Your kindness and caring has more than surpassed our expectations in a Real Estate Agent. You can be sure we will refer you to EVERYONE we know & meet. We will be in touch. Thank you for the gift. It was greatly appreciated. Thank you for assisting us through this process. It took sometime but definitely worth it. We appreciate you being patient with us and giving us lots of your time. Your commitment to us was much appreciated. We will keep in touch and will definitely send potential clients your way. Just a short note to thank you for all you have done to "change my life". I'm sure it wasn't easy dealing with all the different personalities, but you never tired and put so much effort into selling my Boxford home and relocating me to the town I always wanted to live in. I have you to thank for "changing my life" literally. The boys and I want to thank you for your professionalism, generosity and friendship. First, I don't know where to begin. So let's start with a heart felt thank you for your efforts over the last few YEARS to make MJ's dream a reality. Selling Pine Plain Road was no easy task, but you did it and you were able to work the deal for Newburyport in time to avoid having to move twice. MJ pulled up to Newburyport today with a grin from ear to ear...that alone made it all worth it to Nick and me. So thanks again for everything. I know you went above and beyond for MJ and it is more than appreciated. We would like to express our gratitude for the exemplary performance of Catherine Hubbard. In our endeavor to find a new home, off and on it has been the best part of two years. We have viewed over 40 homes, viewed literally hundreds of listings that Catherine had sent and all the while Catherine was always positive and upbeat even through the short sales that were dragging on to no avail, not to count the endless list of offers we submitted. Catherine's professionalism and dexterity guided us through some trying times. Not only rallying to prospective buyers for our home but being relentless in finding us a new home that fit our needs and wishes, which incidentally is accommodating us perfectly. We could not have built a custom home to suit us any better. By Catherine introducing us to the entire team needed to make this happen from financial advisors to the closing attorney. My name is Pamella and my daughter's name is Heather. We would like to take this time to express our Thanks to Catherine Hubbard!! She was our Real Estate Agent for a short time! The reason it was only for a short time is because she knew how to do her job very well! She found us the house we wanted and needed!! She did the homework on the property that we did look at before we closed on our new home!! She was very helpful with all the necessary steps that needed to be taken to close on our home!! There were no surprises! She was very professional and friendly! If we ever buy another house we will definitely hire Catherine! David asked me to drop you an email just to let you know that he thinks you are just the nicest person, and he really appreciates your help on these closings. I told her you've been great on the closings we've worked on, being very professional and keeping right on top of everything. A lot of the brokers could use some tips from you!! Hope to work with you again soon!! We just got your card and gift card yesterday, thank you so much. It has been a pleasure working with you as well. Thank you so much for making so much time for us. I know that this was not your biggest sale but I know that you treated it like it was and I appreciate it very much. I will definitely refer anyone I know that is looking for a home to you, and we will be sure to call you down the road when we start looking for an investment property. Thank you for playing such an important part in one of biggest decisions. You have been absolutely wonderful. I just wanted to say how nice it was working with you and to thank you for making my first home purchase so easy. Your confidence and non-stop energy made it such an enjoyable experience. I'm glad I was referred to you, and I'll be happy to do the same! This is a thank you note to let you know how much Alec and I greatly appreciate all the work you've done to help sell our house so we could move across the country with ease. You sold our home with perfect timing! We know our home would never have sold so quickly without your help. Your very sharp mind that sees the broad picture and helped us to focus on what's important, as well as your patience and understanding, have been so very valuable. You even taught us how to present the house for the quickest sale! We also think you did an excellent job advertising the house and conducting the open houses on the weekends. The extras you provided were wonderful! Your lists of workmen for every type of house repair was so significant. You helped us find the very best painters. You also have a terrific sense of humor that made even the selling of our house to be a fun time! Over the years, Alec and I have sold six different houses in this area of Massachusetts. You are by far the very best and the most dedicated real estate broker we have ever had, and we are extremely thankful for all the time and energy you've given us. It's been a pleasure and a privilege to get to know you! We'll let you know how we make out in Colorado! We would like to thank you and your colleagues at Boxford Village Properties in assisting us to find and purchase our new home. At the end of the process, we felt that you serviced our needs both professionally and with great empathy. We were particularly impressed that no matter how small a request from us was, you provided the answer promptly, accurately and more importantly in a manner that encouraged us not to be concerned how many times we were calling you for "this that and the other." Once again thank you for your very professional assistance in the purchase of our new home. We wish you every success in your career. I wanted to let you know that I am all settled into my new "home" in Beverly. I say "home" because I am there 90% of the time! My business is doing well and I wanted to take a moment to thank you for all your hard work during the negotiation process. So once again, thank you for all your hard work. I can, and will, recommend your services to my associates and friends! Take care and thanks, Catherine. Thank you so much for helping us find our new home. Your services were useful to us in so many ways. , we weren't just buying a new home, we were relocating to a brand new area of the country. The resources you provided to us, including detailed information on neighborhoods and communities, were extremely helpful to us in selecting a location that was right for our lifestyle and budget. We also really appreciated your tips and guidance on local real estate customs that were unfamiliar to us. We probably weren't even aware of half of things you were managing behind the scenes (managing and scheduling appointments, fire certificate inspections, working with our lender, etc.) until the whole process came together at closing just as planned. You made the entire process altogether very comfortable and worry-free. We can't imagine we'd be as happy with our new home without you! Recommend you? To anyone who asked!! !